Chennai : From Prime Minister Narendra Modi to cricketing stars including Kapil Dev and Virender Sehwag, the whole nation showered praise on Varun Nair for scoring a triple ton against England in Chennai Test. Nair scored 303 runs (not out) in 381 balls to become the second Indian batsman to score triple ton in Test format after Virender Sehwag. His triple century was studded with 32 boundaries and four huge sixes as India took a comfortable lead of 282 runs against the England. "Congratulations on the historic triple century karun126! We all are delighted & proud of your remarkable feat," PM Narendra Modi wrote on his twitter handle. Other politicians also congratulated him for achieving the landmark. "what a player! What a knock! 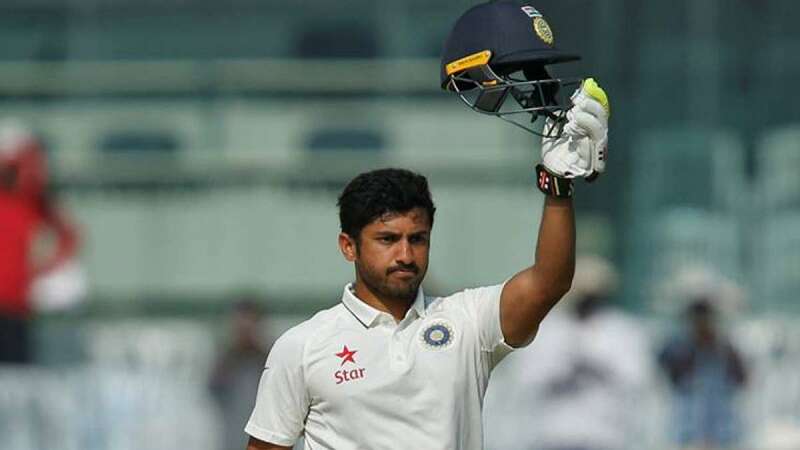 Take a bow, karun126 for being 3rd cricketer & 1st Indian to convert maiden century into a triple hundred!" tweeted Minister of State (I&B) Rajyavardhan Rathore. "Congratulation Karun for this amazing feat. Your batting was like poetry. I hope you get another one very soon," Sehwag, who is the only other Indian to have scored a triple ton, said. He also wrote on his twitter handle: "Yay ! Welcome to the 300 club karun126 . It was very lonely here for the last 12 years 8 months. Wish you the very best Karun.Maza aa gaya!" Other cricket stars also praised his performance and wished him more such innings in future. Kapil Dev: I am at a loss of words to comment on what he did. He seems such a level-headed youngster. His style of batting is very impressive. Very few batsmen can do what he has done. VVS Laxman: Rahul Dravid would be proud of him. He has taught players to work hard and stay committed to their game. Karun spent two months with Dravid during India A tour of Australia. He probably went through mental conditioning during that period. He showed the hunger to keep going even after completing his hundred. BCCI president Anurag Thakur: What a day 4 India at Chepauk. karun126 heartiest congratulations on this marvelous 300. 2nd Indian to achieve after @virendersehwag BCCI. Mohammad Kaif: Karun Nair reaches 250, a landmark only 3 other Indians virendersehwag (4times), Dravid and VVSLaxman281 (1each) have reached. Ajinkya Rahane: Well done karun, very well deserved. Keep it going. Chris Gayle: Welcome to the 300 club youngster karun126 ?????????? #Super. Shane Warne: In bed watching India V England. Great batting from Karun. But India should've declared 40 mins ago & had an hour at England.